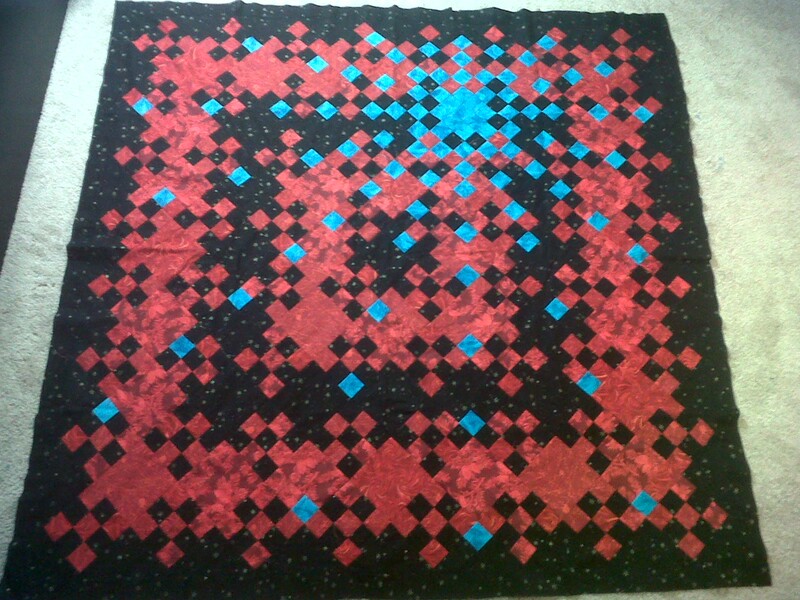 Later this week or next week, I’m planning on quilting this. I have no idea what to do. Part of me wants to do a simple design, and do grey thread, but then part of me wants to do something with turquoise thread, and just have some wild and crazy fun! What does everyone think I should do? I like the turquoise thread idea. Maybe something staring in the center of the star and going out to the edges to connect the rays of the star? I think bold and daring, like a bronze metallic stipple . It will pop in all areas of the piece. The design makes me think of a star in the night. I like the idea of a contrasting thread. I think I would pick one that is not in the quilt colors now, so it would contrast everything rather than getting lost in some of the colors.